Migrants disembark after being transferred to Maltese army boats at sea and brought to Valletta harbor, Malta, Saturday, April 13, 2019. Malta has announced a deal that sees four European Union nations taking in the 64 migrants rescued at sea off Libya 10 days ago. Malta announced Saturday that the migrants will be distributed among Germany, France, Portugal and Luxembourg. 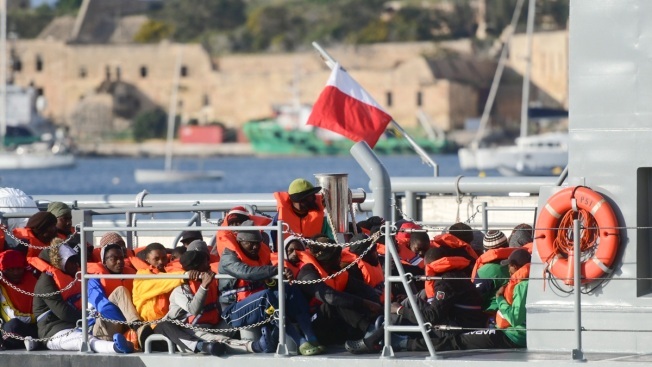 The migrants, who will be distributed among Germany, France, Portugal and Luxembourg, were transferred to Maltese army boats from the ship that saved them and were brought into Valletta's port on Saturday afternoon. However, Malta said the German-flagged aid ship carrying them, the Alan Kurdi, would still not be allowed to enter its ports and none of the migrants will remain permanently in Malta. "Once again, the smallest member of the European Union was put under unnecessary pressure being asked to resolve a case which was neither its responsibility nor its remit," the government said. "A solution was found in order not to let the situation deteriorate further while making it clear Malta cannot keep shouldering this burden."